When she’s not writing about her imaginary friends, Carol Moncado is hanging out with her husband, four kids, and a dog who weighs less than most hard cover books. She prefers watching NCIS to just about anything, except maybe watching Castle. She believes peanut butter M&Ms are the perfect food and Dr. Pepper should come in an IV. When not watching her kids – and the dog – race around her big backyard in Southwest Missouri, she’s teaching American Government at a local community college. 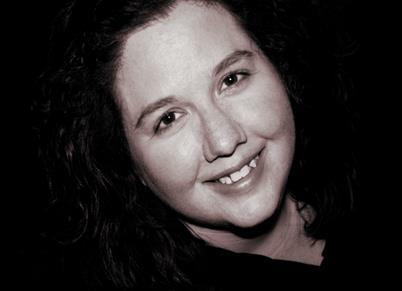 She’s a founding member and President of MozArks ACFW, category coordinator for First Impressions, blogger at InspyRomance. Find her on Facebook and to be among the first to know about new releases, sales, and other fun stuff, sign up for her newsletter! Find all of her books on her Amazon page. Alivia Collins has a favorite food. In fact, it’s right there in the title of her story. 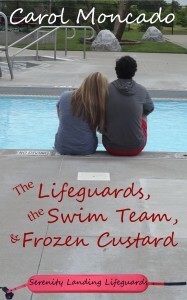 The Lifeguards, the Swim Team, and Frozen Custard released yesterday as part of the SPLASH! Collection. So why frozen custard? Well, it’s summer time. It’s hot. She works at the local town pool as a lifeguard and swim team coach. Most authors will tell you that bits and pieces of themselves appear in almost every character. From a favorite restaurant to our most deep seated fears, our real life bleeds out on those pages. In this case, Alivia’s predilection for the frozen treat comes from my own love of it. In fact, one of the reasons I chose to set my stateside stories in a fictional version of my hometown (rather than in my actual hometown) is because I could make up what kinds of restaurants, etc. are there. See, we don’t have an Andy’s Frozen Custard in my actual town. You have to drive to the nearby city to get frozen custard! And when it’s that hot, who wants to drive like TEN WHOLE MILES to get frozen custard?! Even though gas prices in this part of the country have come way down, most people will stick closer to home. Okay – so it’s not THAT far, but the concept holds. For me, it’s probably a good thing that my town doesn’t have our own Andy’s, but for Alivia, CJ, and the rest of the Serenity Landing Aquatic Center gang, they needed one closer by. You’re not familiar with frozen custard, you say? Well, it’s not custard so don’t think that. It’s also not ice cream or frozen yogurt. In fact, far from it. It’s creamier than either one of those. Smoother, too. It’s my very favorite dessert. My personal favorite is a peanut butter cup concrete (which is, let’s face it, basically a DQ Blizzard but made with frozen custard). There’s a whole bunch of other options, too. Alivia’s favorite is a turtle – vanilla custard, hot fudge, caramel, pecans, and a cherry on top. That’s the real Alivia’s favorite, too. CJ’s favorite is a strawana – vanilla custard with strawberries, bananas, and, in my husband’s case, chocolate syrup. Every town has something unique to it. In my hometown we have a wonderful barbecue restaurant (in fact, the real Alivia and I went there twice while I was researching this story). In a novella I have coming out later this summer, there’s a great bakery. Other towns have the best pizza or a particular kind of ethnic food. As a writer, one of my goals is to create a location you would love to visit. To do that, I have to make it a place I wish existed in real life. With that in mind, I tend to choose my own favorites. But what about you? What kind of things do you like to see in the towns you read about? What is it that makes you want to visit? Lifeguard Alivia Collins looks forward to another summer on the guard stand at the Serenity Landing Aquatic Center. Still smarting from the spectacular implosion of her last relationship, she knows she’s going to have to work to keep herself from falling hard for fellow guard, CJ Kenton. Not only is he cute, but she discovers he’s nothing like any other guy she’s ever known. Keeping her heart safe proves to be more difficult than she imagined when he continually shows her his tender, gentle side. Will he convince her it’s time to take another chance with love? Ginger here: I don’t know about you, but this post made me want to try frozen custard. I never heard of it until I read this novella by Carol, which was wonderful, by the way. It is one of nine (I think) novellas in the Splash! Collection. It can be purchased here. My pleasure. I love sharing good authors with my readers. Enjoyed the visit with Carol. I really enjoyed The Lifeguards, The Swim Team and Frozen Custard. I love Carol’s books. 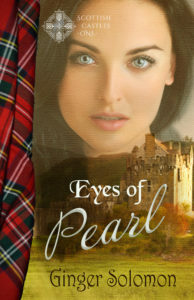 She is one of my favorite romance authors.